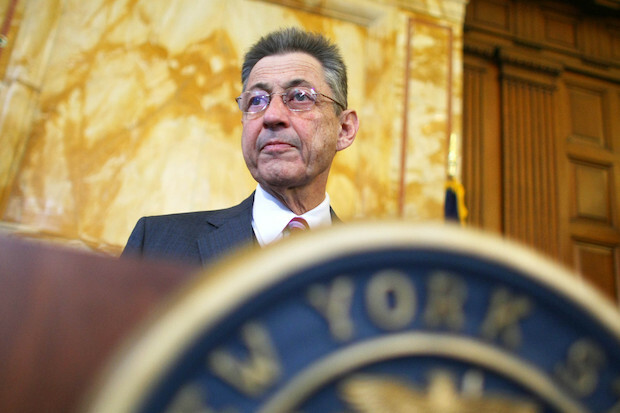 NEW YORK CITY — Outgoing Assembly Speaker Sheldon Silver is taking a leave of absence from the personal injury law firm whose payments federal prosecutors say he used to mask kickbacks and bribes as legitimate income. The firm, Weitz & Luxenberg, said in a statement that it was "shocked" at the allegations that Silver was getting kickbacks for asbestos cancer cases that he directed to the firm for more than a decade. "I will be taking a leave of absence from Weitz & Luxenberg, effective immediately. I am grateful for my time with the firm and do not want the pending and unwarranted allegations against me to be a distraction, especially since there was no wrongdoing by the firm," Silver said in a statement released by the firm. According to prosecutors, Silver received millions of dollars in referral fees for sending asbestos cancer cases to the firm after respected Columbia research doctor Robert Taub, a leading expert in mesothelioma research, referred the cases to Silver, who is a lawyer. In return, Silver directed over $500,000 in taxpayer money he controlled to Taub as grants, got one of Taub's relatives a job and sent another $25,000 grant to a nonprofit where Taub's wife served as a board member, prosecutors said. U.S. Attorney Preet Bharara says Silver did no legal work on the cases and that the firm was unaware that Silver was directing state money to Taub in exchange for the referrals. Silver received $5.3 million from Weitz & Luxenberg over the course of the decade the arrangement was in place, including $1.4 million salary for a no-show job, and $3.9 million in referral fees. In a statement, the founder of the firm said he requested that Silver take the leave. "We were shocked to learn about the allegations against him of impropriety in the referral of cases to our firm. We have asked Mr. Silver to take a leave of absence until these allegations are resolved," Perry Weitz said. "As the U.S Attorney's complaint clearly stated, we were never told that he was ever going to allocate, or had allocated, any state funding in exchange for client names he referred to us," he added. The firm sought to put distance between itself and Silver, saying "Silver was neither a partner nor an employee of Weitz & Luxenberg." The move marks the latest in of Silver's swift fall from power since he was arrested last week on the federal corruption charges. Once one of the most powerful politicians in the state, Silver, 70, will no longer be speaker come Monday, with a Feb. 10 election scheduled to determine a replacement. His bid to step aside and have five senior members lead in a power sharing arrangement was knocked by Gov. Andrew Cuomo. Mayor Bill de Blasio remains one of Silver's few remaining supporters, calling the speaker "a man of integrity" last week and saying Tuesday that he didn't think Silver should resign as speaker. Silver has maintained his innocence and has said he will not resign his Assembly seat. "I wish the firm and its lawyers well as they continue their outstanding work on behalf of their many clients," he said.